TwinPak V-Packing - System Seals Inc. The 118 series TwinPak is a high-performance multi-component seal assembly using design principles developed in our Elite product line. Operating performance is enhanced by having the components work together, preventing extrusion all while offering impressive seal performance. The seal is available in both endless and split configuration. 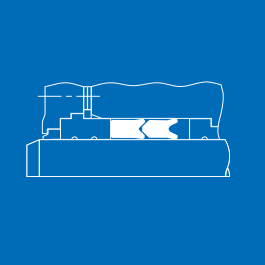 The 118 series TwinPak V-Packing is made up of two components designed for use in hydraulic applications. The 118 series TwinPak features high-grade polyurethane. Standard seal ring materials are MP03 machined H-PU, available up to 2100 mm in diameter. To suit a variety of applications the series is also available in NBR, H-NBR, EPDM, and high temperature-resistant FPM. The backup ring materials include POM, polyamide, PTFE with bronze filler and PEEK.